"Maybe we do need to kill people. Do you want to be the person who does that?" Love something enough, and your obsession will punch holes through the laws of physics. That devotion creates a myriad of unique magics: videogamemancers, culinomancers, bureaucromancers. First let me state that I didn't know this was book two in a series until I'd already read 90% of the novel, which means it can be read as a stand alone without missing out on anything. 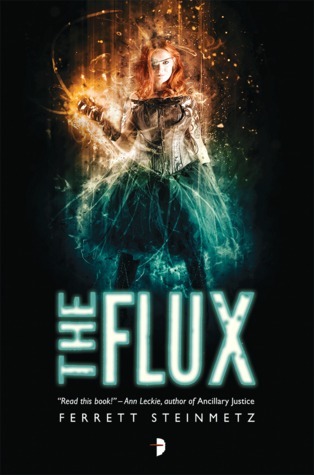 Yes, there were a couple of times Steinmetz referred to events I'm going to assume took place in book one, The Flex; however, the majority of the time, any past history was given enough backstory/explanation for me to be able to comfortably read The Flux without being lost. Second, I really, really liked the uniqueness of the world of magic Steinmetz has created with his novels. It's very well thought out, and structured, making sure that the stronger of the 'mancers are still held accountable for their actions and not impervious to any sort of backlash. It was exciting to see how someone obsessed with video games would see the world, and its rules, through the use of 'mancy. I also enjoyed the addition of such human dynamics between all of the characters. Whether it was the awkward tangle of Paul and his ex-wife Imani, her new husband David, and their daughter Aliyah, the very master and subject relationship with Payne and Paul, or the fantastic friendship Victoria and Paul shared; everything was so real and believable that it was a simple matter to believe that yes, 'mancy could work in a world much like our own. Steinmetz has done a wonderful job of blending superb battles between the 'mancers and mundanes, with heart wrenching moments with Paul and his eight-year-old daughter Aliyah, while still walking the tightrope of creating a story about family, good vs evil, and trust. I will definitely be hunting down The Flex to figure out what I may have missed in skipping it, and adding a copy of The Flux to my personal library once it hits bookstores. -Digital ARC provided by NetGalley, in return for a review.